Duke Law School’s newest research center is devoted to the development and dissemination of reliable and balanced scholarship on issues surrounding firearms, gun rights and regulation, and the Second Amendment. 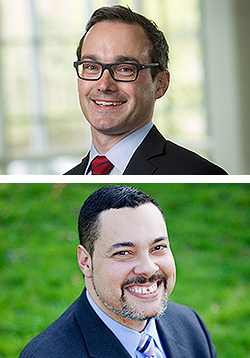 The Duke Center for Firearms Law launched in August with Professors Joseph Blocher and Darrell Miller as co-directors. Blocher and Miller are leading constitutional scholars who have written extensively about the Second Amendment, most recently co-authoring The Positive Second Amendment: Rights, Regulation, and the Future of Heller, published in September by Cambridge University Press. Through its programming and development of resources, they hope the center will encourage others to undertake serious research and scholarship that reclaims the Second Amendment from distortions and misconceptions they argue currently surround it. Jacob Charles ’13 returns to Duke Law on Feb. 25 as the center’s inaugural executive director. “There are not enough constitutional law scholars working on Second Amendment issues, an area where the impact of scholarship can be — and has been — profound,” said Blocher, the Lanty L. Smith ’67 Professor of Law. He cited the landmark 2008 Supreme Court opinion in District of Columbia v. Heller, in which the Court found, for the first time, a right to keep and bear arms for private purposes. The opinion relied heavily on gun rights scholarship, citing scholarly and secondary materials more often than all constitutional provisions, statutes, and cases combined, Blocher said. Through its conferences and symposia and mentoring of scholars and fellows, the two hope the center can significantly shape firearms law and policy as a scholarly field, developing resources to help inform the opinions and actions of lawyers and policymakers, among others. One major resource of the new center is the searchable Repository of Historical Gun Laws, a database compiling English statutes from the Middle Ages through 1776 and those in the United States from the Colonial era to the middle of the 20th century. Miller and Blocher brought the repository to Duke Law in 2017 for use as a research tool for scholars, litigators, journalists, and others interested in firearms regulation and the Second Amendment. Conceived as a resource by Saul Cornell, the Paul and Diane Guenther Chair in American History at Fordham University, and created in partnership with researchers at Duke, Fordham University, and elsewhere, the repository contains more than 1,500 examples of American gun regulations as well as historical European regulations that informed U.S. lawmakers’ thoughts on the issue. The Heller and McDonald opinions relied heavily on history to define the scope of the right to bear arms, said Miller. “In fact, Justice [Antonin] Scalia says in the Heller opinion that you understand the contours of the Second Amendment by reference to regulations that are longstanding.” Yet the repository reflects the first catalogue of historical regulations. In addition to their new book, which offers the first comprehensive account of the history, theory, and law of the right to keep and bear arms in the aftermath of Heller, Miller’s and Blocher’s scholarship on the issue has been cited extensively by scholars, in briefs to and opinions of the Supreme Court and other federal and state courts, and in congressional testimony. They are co-authors of “What is Gun Control? Direct Burdens, Incidental Burdens, and the Boundaries of the Second Amendment,” 83 University of Chicago Law Review 295 (2016), an exploration of how and whether the Second Amendment applies to general common law concepts, like negligence or assault; and “Lethality, Public Carry, and Adequate Alternatives,” 53 Harvard Journal on Legislation 279 (2016), an investigation on how the availability of non-lethal self-defense technology affects the constitutionality of regulations of public carrying of lethal arms. Miller’s works on firearms law and the Second Amendment include “Text History and Tradition: What the Seventh Amendment Can Teach Us About the Second,” 122 Yale Law Journal 852 (2013), which maps out what a history-centric approach to Second Amendment claims would look like, and “Second Amendment Traditionalism and Desuetude,” 14 Georgetown Journal of Law & Public Policy 223 (2016), about the role of traditionalism in Supreme Court decisions involving government regulation. The article is the subject of an online Duke Law Journal symposium, which includes a piece on the future of Second Amendment scholarship co-authored by Blocher and Ruben, a fellow of the Brennan Center for Justice at New York University School of Law who will be joining the faculty at SMU Dedman School of Law next year. Blocher’s scholarship on the post-Heller legal landscape also includes “Firearm Localism,” 123 Yale Law Journal 82 (2013), which argues that Second Amendment doctrine and state preemption laws can and should incorporate longstanding and sensible differences between urban and rural gun use and regulation. Charles joins the center as executive director after focusing on consumer and products litigation in state and federal courts as an associate at McGuireWoods in Raleigh. He earlier clerked for Judge Allyson K. Duncan ’75 of the U.S. Court of Appeals for the Fourth Circuit and now-Chief Judge Colleen McMahon of the U.S. District Court for the Southern District of New York, and he practiced for two years in the Washington, D.C., office of O’Melveny & Myers, where he represented clients in civil litigation as well as government and congressional investigations. Charles will facilitate and oversee a slate of programming that in the spring semester includes a Feb. 28 panel discussion on the future of the Second Amendment with two leading firearms law scholars, David Kopel, research director at the Independence Institute and associate policy analyst at the Cato Institute, and George Mocsary of the Southern Illinois University School of Law, and a March 4 conversation about the Supreme Court, the Second Amendment, and the future of gun rights regulation with constitutional scholars Walter Dellinger, the Douglas B. Maggs Professor Emeritus of Law, and Sanford Levinson of the University of Texas. Next fall, the center will host a symposium titled “Gun Rights and Regulation Outside the Home,” the proceedings of which will be published by Law & Contemporary Problems. The center is also participating in ongoing interdisciplinary research with Duke’s Department of Psychiatry on the relationship between mental health and guns. The Center for Firearms Law is supported by grants from the Katie McGrath & J. J. Abrams Family Foundation, Crankstart, Everytown for Gun Safety, the Joyce Foundation, Andrew Marks, Howard & Nancy Marks, and Arthur & Toni Rembe Rock.